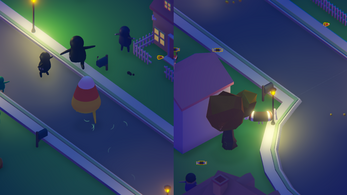 Candy corn and Tootsie roll are on a quest of revenge. 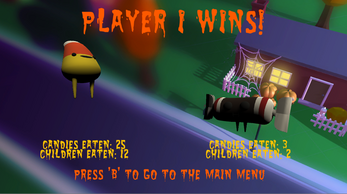 In this role-reversal game, the candy is out to eat the children on Halloween. 1. Unzip the zip file that was downloaded. 2. Keep all of the files in the same directory as they were provided. 3. Launch the game and use the mouse in the menu. 2 xbox controllers will be needed in order to play.